A good start. Not! Oh well, it makes my task as to who to select up front easier. It will be my up and coming talent that will have to carry us home. Champions! We did what was required with a comprehensive 3-0 victory over Bloemfontein Celtic. This was accomplished by a brilliant hat-trick by 19 year old Thabo Majola who has so far bagged 7 goals in 7 appearances. 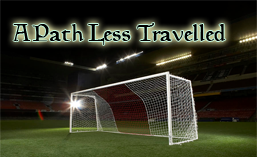 The game was closer than the scoreline indicates however, and was in the balance right up to our third goal. Having to play the final with only three days rest was not ideal, but most concerning was to lose Motoo Nogi to international duty for the game. This allowed me to give Chuckwudi Bright a start in the final, and what would be his last game for the club. A fitting sign off to a long career. What a result! We dominated the game allowing only one shot all game. Thoroughly satisfying performance by the lads and in the end we totally frustrated the opposition. That young man Majola did it again! Five goals in the two most important games of the season. Final standings, for completeness sake! Notice Sundowns in 6th – if they could have converted three draws to wins the title would have been theirs! 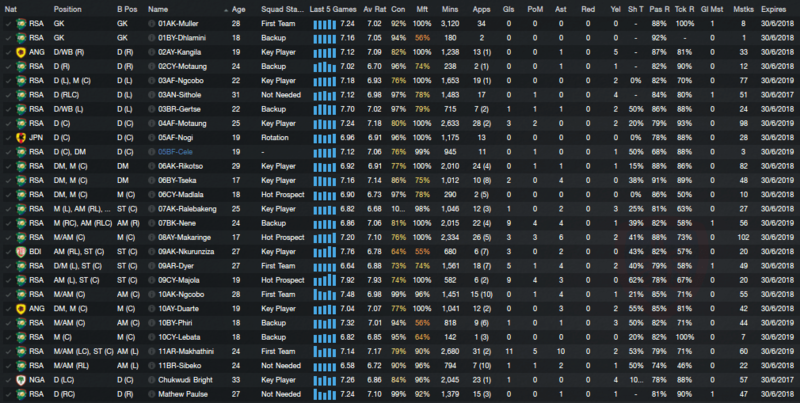 Statistical run down of my first team squad. Does not show the contributions of the players who are in Reserves. A club legend is retained by the club! Shown for completeness as this is a journeyman series after all.